University Archives' upcoming online sale on January 23 features handwritten lyrics from Bob Dylan, presidential memorabilia from Washington to Bush, and much more. 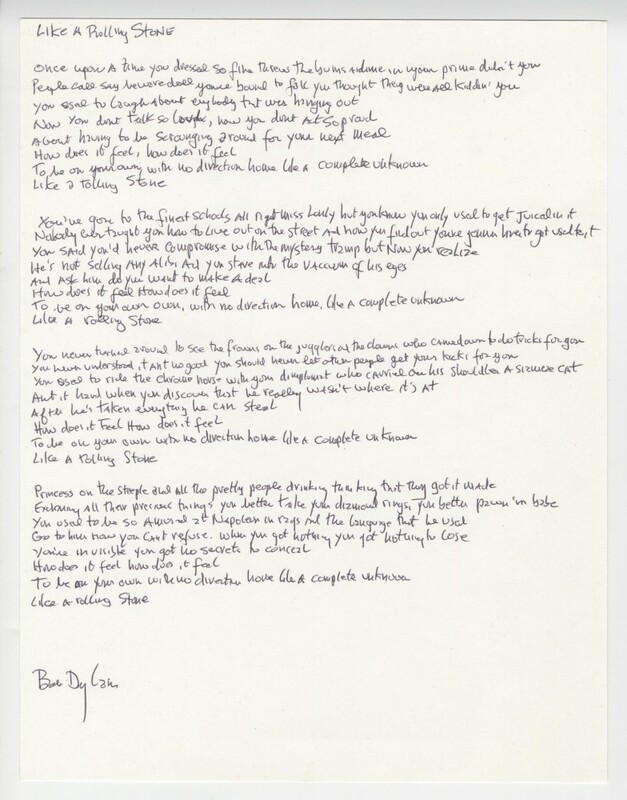 Bob Dylan’s signed, handwritten lyrics to his iconic song 'Like a Rolling Stone', items relating to the recently deceased former President George H.W. 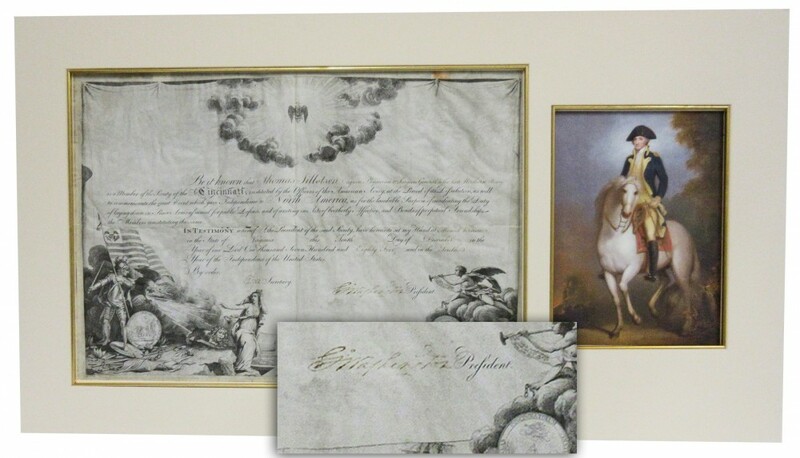 Bush, plus rare and highly collectible items pertaining to Presidents Washington, Lincoln and other luminaries will be featured in University Archives’ next major online-only auction, scheduled for Wednesday, January 23rd. Major categories will include Civil War and Revolutionary War collectibles, space and aviation (including letters written and signed by deceased moonwalkers Neil Armstrong and Jim Irwin), science (including lots signed by Sigmund Freud, Charles Darwin and Samuel F.B. Morse), World War II items, and U.S. Presidents memorabilia, for which University Archives is famous. Dylan’s signed, handwritten lyrics to Like a Rolling Stone – voted the #1 rock song of all time by Rolling Stone magazine in 2004 – was consigned by the same person who sold Dylan’s signed lyrics to The Times They Are A-Changin’ in University Archives’ recent auction (they realized $137,500). Like a Rolling Stone is arguably the superior collectible and has a pre-sale estimate of $50,000-$60,000. Also sold will be a copy of the Dylan album Blonde on Blonde, signed by him. The George H.W. Bush lots include a three-page letter typed on White House stationery in 1991, signed by Bush and written to journalist Richard Cramer, in which he explains his rationale for launching Operation Desert Storm and calls Saddam Hussein the “Picture of Evil” (est. 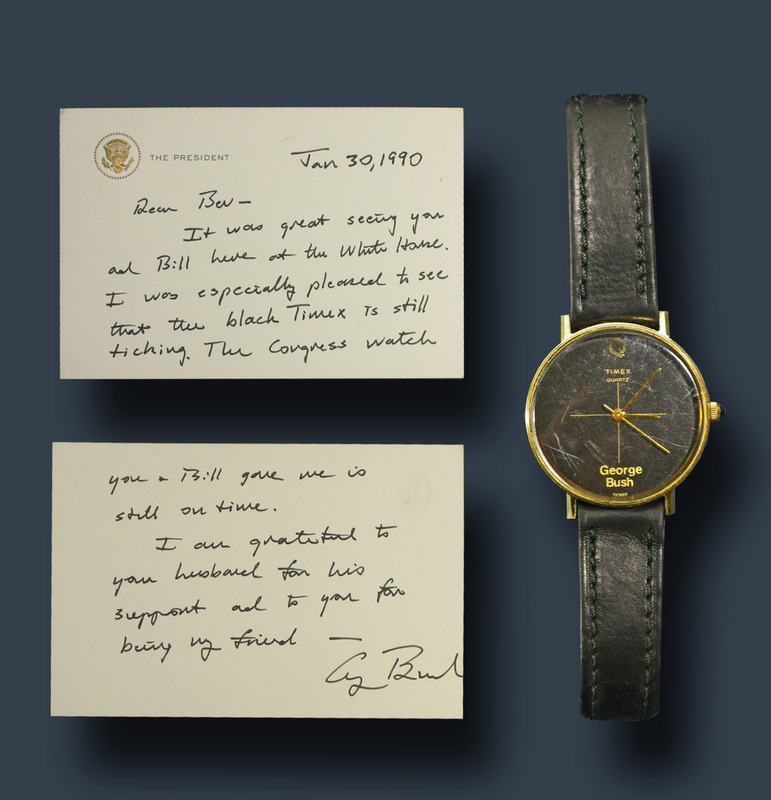 $8,000-$9,000); and Bush’s own Timex watch presented by him to incumbent Republican Congressman Bill Young in 1990, along with a hand-signed note to Young and his wife Bev (est. $5,000-$6,000). Collectors can’t get enough of George Washington. Lots pertaining to the first President include a letter signed by Washington in 1780 (with the main body penned by military secretary Robert Hanson Harrison), in which he writes of the harsh winter in Morristown, N.J. (est. $15,000-$16,000); and a signed document from 1785, endorsing Thomas Tillotson, a medical surgeon in the Revolutionary War, for membership in The Society of Cincinnati (est. $12,000-$14,000). 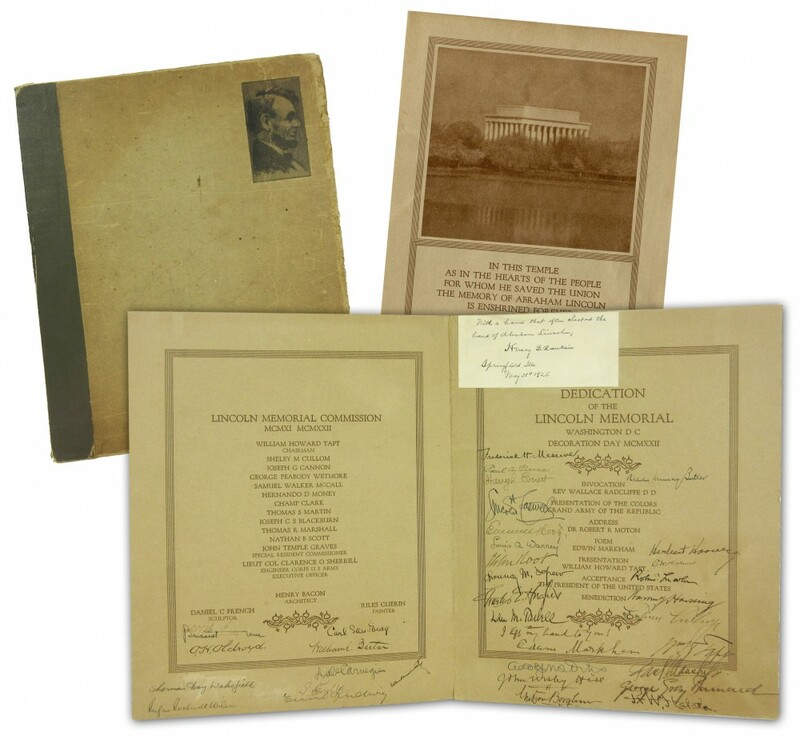 A unique Lincoln Memorial dedication program signed by four U.S. Presidents and more than 30 Lincoln scholars, artists and other important attendees is bound to attract keen bidder interest. The handsome, oversized presentation album is hand-signed by former President William H. Taft, Warren G. Harding (the sitting president at the time), and future presidents Calvin Coolidge and Herbert Hoover. Measuring 10 ¾ inches by 13 inches, the book should bring $6,000-$7,000. Space and science – two burgeoning genres of collectible – will be well-represented in the sale. A letter handwritten and signed by Neil Armstrong on NASA letterhead, addressed to a “Mr. Glass” in which Armstrong mentions his seven X-15 flights, should soar to $7,000-$8,000; while an original two-page scientific manuscript, inscribed overall by French physicist Antoine Henri Becquerel (1852-1908), the discoverer of radioactivity, is expected to finish at $3,000-$3,250. 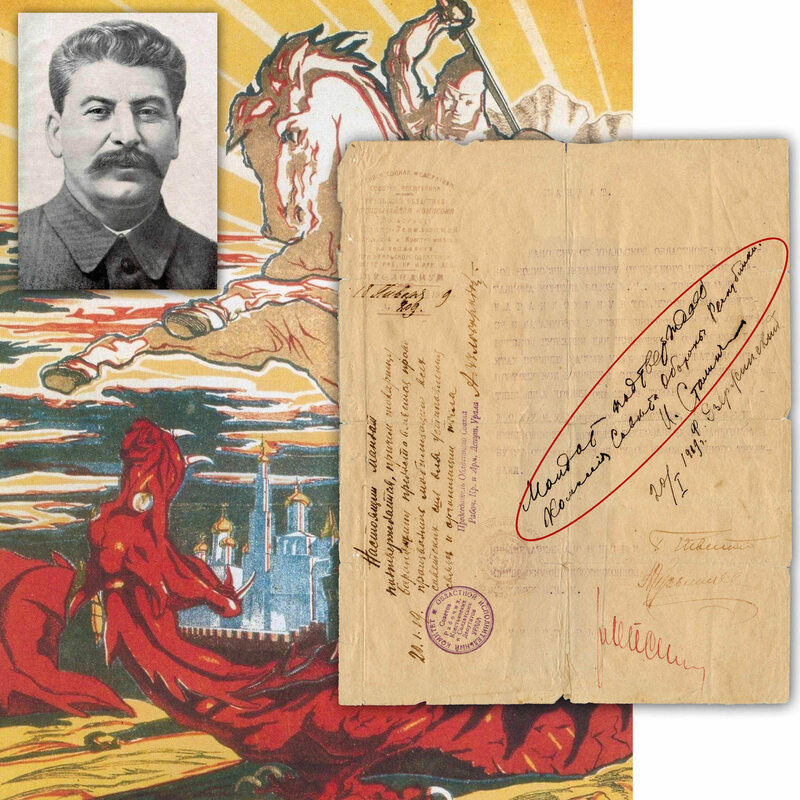 A highly important document from 1919, typewritten in Russian and boldly signed by Joseph Stalin (1878-1953) and others (including Czar Nicholas’s executioner, Felix Dzerzhinsky (1877-1926), on cream letterhead, should bring $12,000-$14,000; while a glossy black and white photo signed by Douglas MacArthur, showing the World War II general landing at Leyte Island in the Philippines in Oct. 1944, one of the finest examples known, has an estimate of $3,000-$3,250. 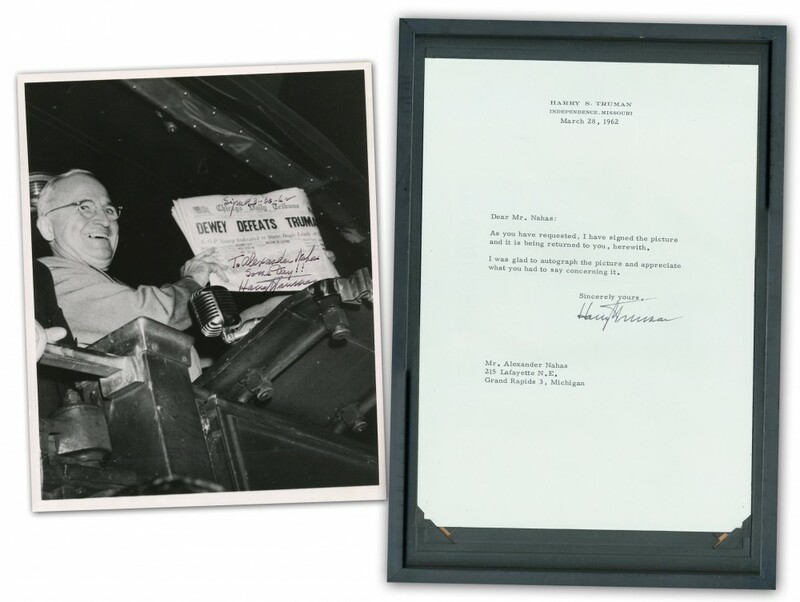 In one of the early real-life examples of “fake news”, a photo of President Harry S. Truman holding up a copy of a newspaper that carried the false headline “Dewey Defeats Truman” from the 1948 presidential election, signed by Truman, has an estimate of $6,000-$7,000. 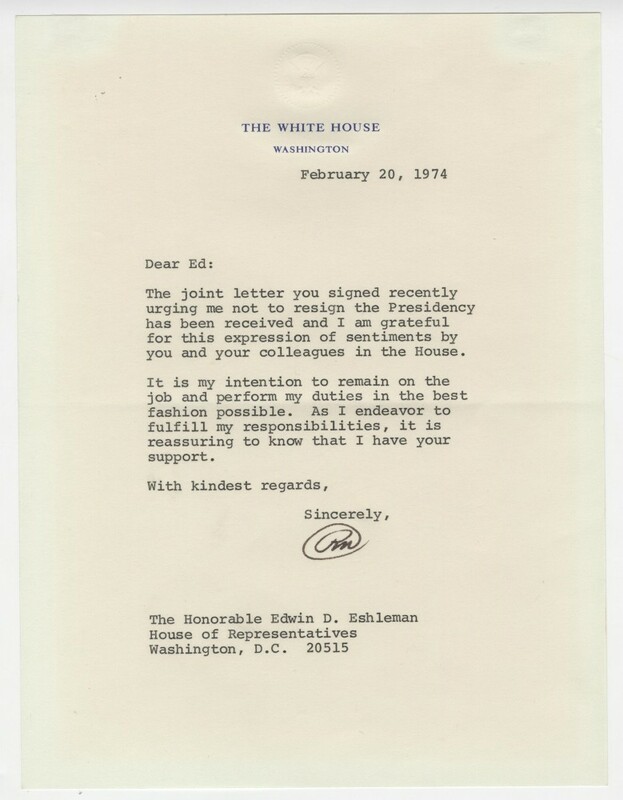 Also, a letter typed on White House stationery in 1974 and signed by President Richard Nixon, in which he thanks a supporter for “urging me not to resign the Presidency,” should garner $4,000-$5,000. 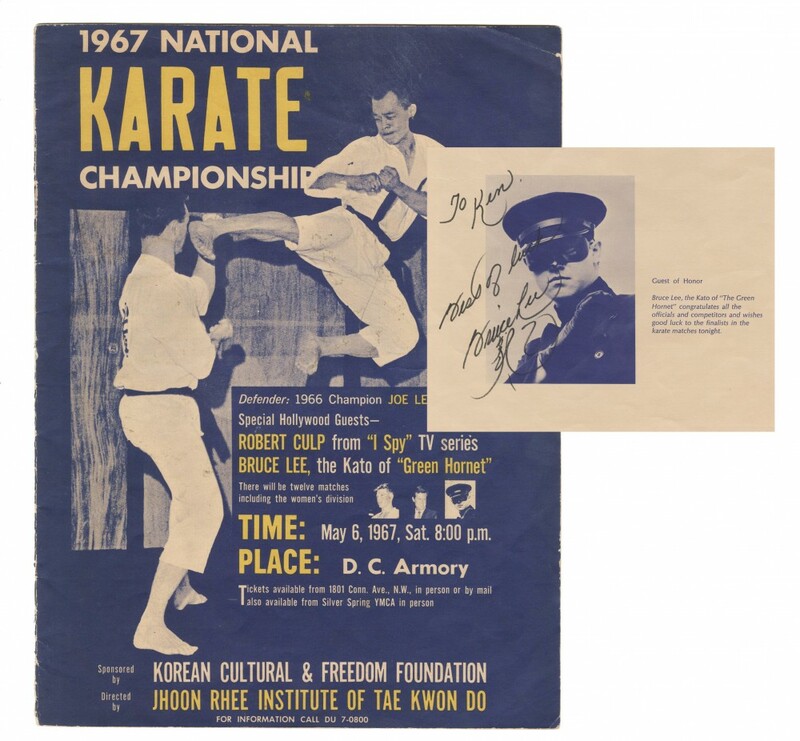 Rounding out just a couple more highlights from the catalog, one of the finest known signed images of Bruce Lee, pictured as “Kato” from The Green Hornet in a program guide for the National Karate Championship of 1967, inscribed to a fan, is expected to hit $15,000-$17,000; while a document twice-signed in 1791 by John Marshall, while Secretary of State under John Adams, selling four shares in The Bank of the United States, should command $4,000-$5,000.